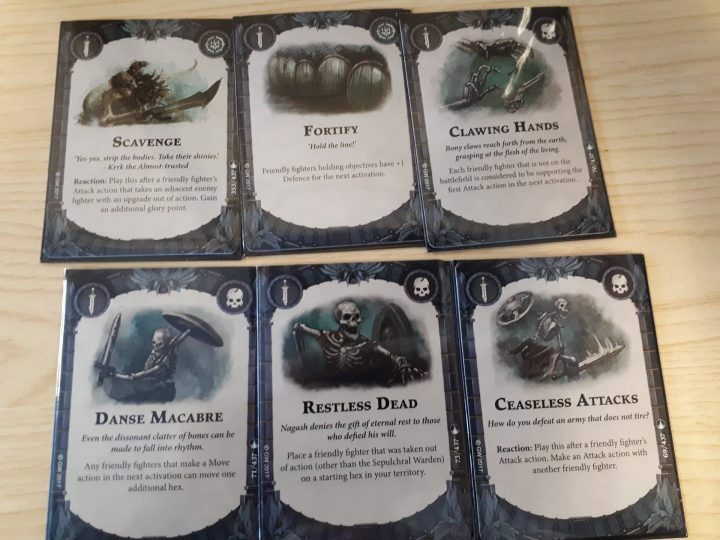 So we may have missed the boat with Halloween now being a few days behind us but this still seems a fine opportunity to shuffle some Sepulchral Guard in Shadespire! The Sepulchral Guard, hot out of the molds from Games Workshop for Shadespire are possibly the most unusual warband up to now. They have the most models at a whopping seven and they can be resurrected after being taken out of action. I’m here to offer an idea or two on how to take advantage of all these bodies. Welcome to my strategy dubbed – The Bone Bunkers. If you need the skinny on Shadespire I’ll give you a quick run down. 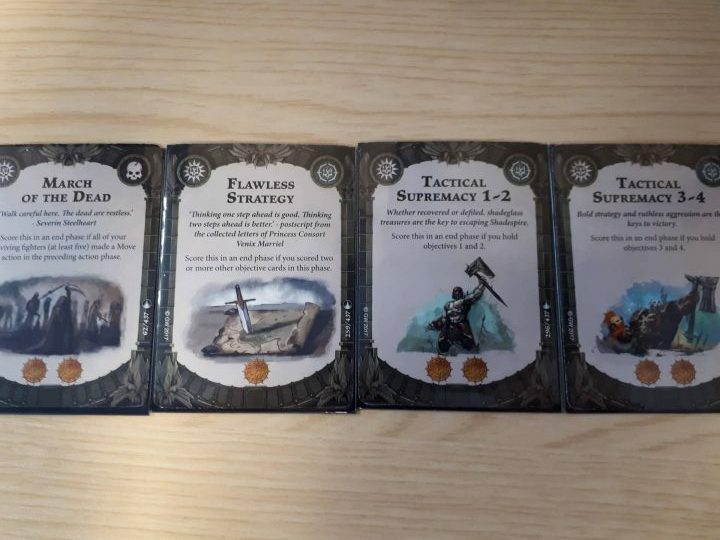 Using miniatures on a game board and a built deck of cards you attempt to gain Glory Points by defeating enemy models or by completing objective cards in your hand. Your objective may not necessarily be to obliterate all enemy models, you want to pay attention to your Objective Cards. Not only will this ensure victory but will also allow you to upgrade and improve your fighters. Thus, getting Glory Points early is gravely important. These are cards that, to me, make sense to try to grab a hold of as early as possible. These will allow you to potentially acquire some glory points swiftly and with minimal bloodshed. 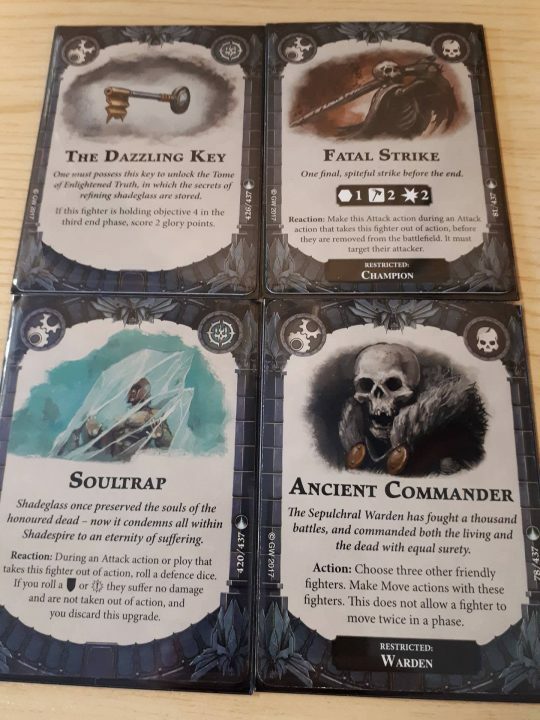 The Sepulchral Guard have some good fighters but you want to pick your fights very carefully. Use your amount of bodies to try to capture as many objectives as you can and snag some glory early on. The glory you gain in the first phase will allow you to buy upgrades. You’ll see a few of these cards help the movement of the Sepulchral Guard; any one hex can make a big difference. For this build I’d focus on defense and movement. Focus on getting your models into position and then keeping them there. This is aided by the Warden and his ability to move more than one fighter at once to help set-up in the first round. You’ll have a lot more cards than this but I’d definitely advise getting Sidestep or Confusion in there. This is just in case you’re one hex away from a critical objective being completed. Giving the Champion some powerful upgrades can be a big help as he’s one of your hard hitters. Your Warden is a viable fighter himself but typically I would focus on keeping him safe, especially in the first two rounds of the game. Without him you cannot resurrect your out of action fighters which would be a devastating blow early game. Soultrap would be something to keep handy just in case he finds himself in a sticky situation. Again, this example focuses on capturing objectives rather than charging in and getting dicey. If you do lose some fighters try to make it pay off for you with cards like Restless Dead to revive a fighter. This could also be a confident gamble should you wish to quickly shamble back to your board for a specific objective. Holding every objective on the boards by an end phase completes the Claim The City card will score five Glory Points. It is unlikely, but that’d be bold and major play for the Sepulchral Guard. We’ll be bringing you more articles and thoughts on Shadespire and its expansions over the coming weeks. Be sure to stop by our Facebook for all our latest updates and news! I’m liking the “hold objective 1, 2, and 1&2” along with the upgrade that allows you to switch objectives with this group. You can throw in the upgrade “key” for objective 2 also to really run the strat.